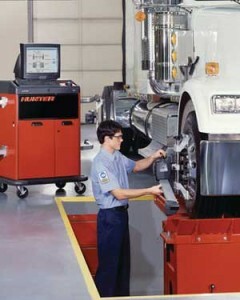 Proper wheel alignment is crucial to safely operating your truck. Misalignment can be caused by many things, but being on the road a lot or driving on uneven surfaces accelerates and exacerbates the issue. If you’re noticing uneven tire wear, steering wheel vibrations, and a slight pull to one side or the other when driving, it may be time to bring your vehicle in for an alignment.